Saturday: 8am Divine Liturgy; 5:30pm Great Vespers. Sunday: 7:30am Matins; 9am Divine Liturgy and potluck. Daily and festal services vary. Please see our service schedule. The trikerion is dipped into the water. Photo courtesy of Jim King. Bishop Benedict reads the prayer of ordination to the subdiaconate. Bishop +Benedict greets children of the parish. Photo courtesy of Matthew Kenenitz. Fr. David sprinkles the fruit with holy water. The long prayer of sanctification is read over the water. Photo courtesy of Jim King. The choir. Photo courtesy of Jim King. 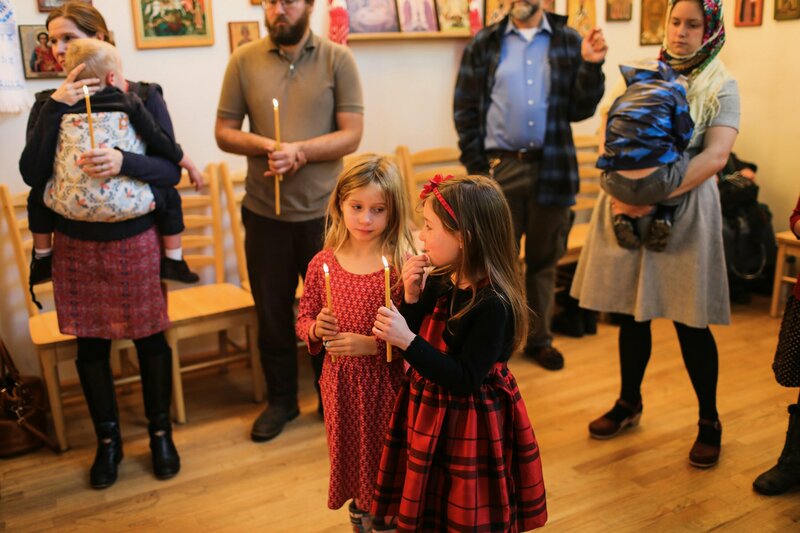 Children hold candles during the blessing. Photo courtesy of Jim King.